Community Involvement Award – Active community partners are crucial to thriving youth service organizations. These partners help in many ways: assisting with financial or in-kind needs; supplying employees as volunteers; or serving as a Safe Place site, opening their doors to young people in need. The successful nominee will be a business, serving as a community partner, which has consistently gone above and beyond the expectations of the local program. Demonstrating consistent professional and/or organizational development in the areas of cultural competency and social justice. Demonstrate leadership in securing or maintaining access to resources, representation and/or decision making power for all youth, their families and community. Executive Leadership Award – Many youth service providers have had the privilege to work with an individual who consistently goes out of his or her way to lead staff in providing quality services for youth and families. This award seeks to recognize a leader who is consistently dedicated to staff and works hard to fulfill the mission of the youth service organization. The selected nominee must be an executive leader with at least three years of involvement with a youth service organization. Developed effective, innovative responses to the needs of youth. Demonstrated exemplary youth advocacy efforts. Exhibited broad leadership and commendable service. Achieved recognizable accomplishments and positively influenced the field of youth services. Commitment to youth and families and services provided to enhance the lives of those in need. 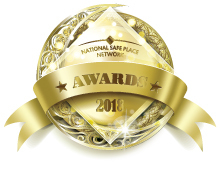 Commitment to the values of the National Safe Place Network as demonstrated through participation and support of the work carried out by NSPN and its affiliates. Commitment to advancing the field of youth work through support of innovative programming, collaboration, advocacy and research. Commitment to serving as an exemplary role model to youth, families and community members. Developed a strategy which demonstrates creativity and innovation in providing services to youth and families. Demonstrated program effectiveness through evaluation efforts. Exhibited potential for replication in other organizations. Demonstrated effectiveness through testimonials from clients or other agencies. Safe Place Coordinator Of The Year – Year in and year out, the Safe Place Coordinator’s work is vital to a successful program. Many Coordinators work additional hours or under difficult circumstances to maintain a quality program. Essential Coordinator duties include successful fundraising, communication with Safe Place sites, increasing community awareness including outreach to youth, and positively representing the local agency and National Safe Place Network. This award recognizes the Coordinator who provides quality Safe Place program management and does so without expecting recognition for their invaluable efforts. The successful nominee will have a minimum of one year of direct Safe Place coordination. Youth in Action Award – Youth are not only the future. They are the present. They are leaders of change efforts at local, state, and national levels. They are contributing their time and expertise as volunteers, Advisory Board members, paid staff, and members of Boards of Directors. These young people recognize the power of their voices for positive change and are committed to being part of efforts to respond to issues important to their lives and communities. This award recognizes a young person or a group of young people, age 21 and under, whose efforts go above and beyond to make a difference in the lives of others. For example, do you know a group of youth who has started a clothing drive? How about a youth who leads activities in a program? Have you seen a young person advocate for change? Youth share their skills in a variety of ways – look for youth making a difference. Check out the recipients of the 2018 NSPN Awards! NSPN is now accepting nominations for the 2020 NSPN Awards. Submit your nomination today!